The annual festival will take place in Miami Beach this October 2014, with an impressive array of participating eateries. Crack Open Your Fall with the 2nd Annual Hess Select South Beach Seafood Festival Week, October 22-25,2014, with the main event, the all day South Beach Seafood Festival, on Saturday, October 25th from 1-9PM on 7th & Ocean Drive, Lummus Park in Miami Beach, sponsored by Title Sponsor, Hess Select, and hosted by Coca-Cola, among others. The week of events will feature a delightful mix of the very best of what South Florida has to offer event goers in the areas of entertainment, wine & spirits, and culinary scene showcasing Miami’s finest culinary masters and signature brands all to support the Community Initiatives Foundation and their new EAT SMART Campaign. The CI Management team has worked diligently to create an experience not to be forgotten and most definitely will not disappoint, as they provide South Florida locals and visiting “foodies” an opportunity to enjoy signature seafood from multiple premier local restaurants with a little taste for everyone. The Kick Off Dinner at Joe’s Stone Crab will be limited to 50 guests and exclusively hosted for the weekend major sponsors as well as the most VIP seafoodies out there as this event will kick off the weekend with a 4-course meal filled with pounds of Fresh Joe’s Stone Crabs with the season just beginning the week before. Each course will be enhanced by a Master Sommelier experience featuring wines from the Hess Collection and delicious beers from Tenth & Blake Brewery along with a special educational experience from the Joe’s Team. There are only 1 or 2 seats left for this exclusive dinner in Jesse’s Private Room. Tickets are $500 pp. The Thursday Night event will host approx. 150-200 guests as they kick off the Seafood Shuffle at Equinox on 5th and Collins Ave, receive samples and enjoy chef demos from City Hall the Restaurants, before they pick up their tickets and make their way leisurely to different restaurants participating in the Shuffle down Ocean Drive, Collins Ave, and Washington Ave. Each restaurant will provide each guest with a complimentary glass of Hess Select wine or cocktail, sponsored by Bacardi, Stoli, and Herradura and then there are $5 bite menus for guests to purchase as well as opportunity to purchase additional beverages. Be a guest of our restaurant partners and enjoy an experience with friends. Hop on a freebee or walk around and make your way to visit over 10 restaurants around South Beach. Participating restaurants include Siena Tavern, Red the Steakhouse, CJs, Park Central Café , A Fish Called Avalon, Clevelander, Pepe Nero, Poseidon, and Naked Taco. Tickets for the event are $50 per person and include giveaways along with the 10 complimentary cocktails or glass of Hess Select Wine. Event goes, be sure to #SeafoodShuffle ! The night before the festival will be the Chef Showdown @ the Seafood & Sneakers Ball, sponsored by Range Rover and Bacardi, hosted at 9th & Ocean Drive in the GOYA Culinary Pavilion at the event site. The Chef Showdown will bring together some of the area’s most beloved restaurants as their chefs compete head to head for the title of the best seafood dishes in various categories. The most exclusive ticket of the weekend, the new Chef Showdown @ Seafood & Sneakers Ball will be hosted by Celebrity Chef Ralph Pagano and feature Miami’s finest participating in cook-offs on the 305-KITCHEN.com Demo Stages around the venue with the “Cutting Board” experts lending their expertise to choose our winners in each category. But, don’t worry, they don’t have all the say. Attendees will participate in the public vote as guests will visit the tasting stations around the event space showcasing the 12 participating restaurants, sample their signature dishes showcased on the demo stages, and vote on who is the best in each category. Guests will vote like a pro and help choose the evening’s winners! In addition, there will be signature raw bars, featured wine and cocktails, interactive zones, a fashion show featuring #MadeinMiami brands, and more. All sustainable seafood for the event will be provided by event sponsor, Whole Foods. So put on your swankiest footwear and join in the fun for the “gala” evening of the weekend to kick off the fundraising for the new EAT SMART Campaign. Tickets for this event are $150 per person and include all Chef Showdown samples, full raw bar tastings, access to all event open bars featuring the Hess Selection Collection, delicious beers from Blue Moon & Peroni, as well as signature cocktails featuring Bacardi. This event will also be hosted with a private Media Lounge, sponsored by South Florida Executive Magazine, which 40 media representatives will be selected to join in the fun and get exclusive access to the event as well as the restaurants participating in the showdown. Participating restaurants for the Chef Showdown include: Lure Fishbar, Siena Tavern, Red the Steakhouse, Florida Cookery, Oceanaire, Dolce Italian, City Hall, Café Avanti, CIBO, De Rodriguez, Naked Taco, Park Central, and Poseidon. Chefs will be paired based on their signature dishes and the 6 competitions will be announced shortly. Help us decide who makes the best Lobster Roll on the beach or who has the best take on what an outstanding Surf ‘N Turf should be? With your help, we will know who will win this year’s #ChefShowdown. Over 6,500 seafood-lovers supported the newest culinary event of the year in 2013, now considered one of Miami’s annual “do not miss” festivals. Guests agreed after attending last year that the perfect equation was created, one comprised of the beautiful ocean, amazing food and lots of great activities to partake in. The bar has been set high and CI Management is ready for the task. The Hess Select South Beach Seafood Festival will again draw local and visiting foodies, celebrities, and VIPs with participating restaurants featuring Mini Café’s on the sand, entertainment by some of the most popular live bands to include Spam All-Stars, cooking and mixology demonstrations, retail activations, and multiple full bars that will feature a variety of wines from entitlement partner, HESS SELECT, cocktails by local mixologists featuring: Bacardi, Stoli, Tequila Herradura, and Gold Coast Beverages beer, to include Blue Moon, Peroni, Crispin Cider, and Coors Light, and non alcoholic drinks and samples provided by event host, Coca-Cola. Confirmed sponsors to date also include: Premier Beverage, Goya, featuring a new on-site Goya Culinary Pavilion for Premier All Access Pass holders, Warren Henry Automotive Group, Range Rover, Equinox, Coca-Cola, Badia, Doctors Hospital, Walgreens, Arquitectonica, Flowers Baking Co., Metro Signs, Le Cordon Bleu, 50 State Security, US Army, and SFM Services Inc. Participating restaurants for Saturday’s Festival include, but are not limited to: Joe’s Stone Crab, A Fish Called Avalon, Altamare Restaurant, Café Avanti, CIBO, City Hall the Restaurant, CJ’s Crab Shack, Naked Taco, Park Central Café, Poseidon Greek Restaurant, Red the Steakhouse, Tarpon Bend, Smith & Wollensky, and Whole Foods. Each restaurant will showcase 2-3 Menu Items featuring a variety of options to include Grilled Lobster Tails and filet for a Surf ‘N Turf from Red or choice of Seafood tacos from Naked Taco, stone crabs and crab cakes, linguini with clams, mahi sliders, shrimp and grits, bang bang shrimp, lobster mac ‘n cheese, raw bars featuring freshly shucked oysters, and more. This is an eating festival, not a sampling so guests are encouraged to come ready to dive in! The Hess Select South Beach Seafood Festival invites you to come out with friends and enjoy this year’s event. Don’t forget, you can bring the kids too as Goya hosts the “little chefs” in the GOYA Kids Zone for a great day of family fun! Festival General Admission tickets are available for $25, Seafood Lovers for $50, which includes food & beverage tickets and discounted admission, and Premier All Access Pass for $150, which provides a variety of benefits to include access to the Premier Hospitality Village & Lounge and the GOYA Culinary Pavilion, featuring open bars and signature interactive demo stations by partner wine and spirits brands as well as culinary demos, lounges, air-conditioning, and more interactive activities for our “Premier Seafoodies”. Additionally, check out participating event restaurants during the month of October and enjoy signature “SEAFOOD SLAM” Menu items and featured Hess Select Wines to get your pallet ready for our week of fun. 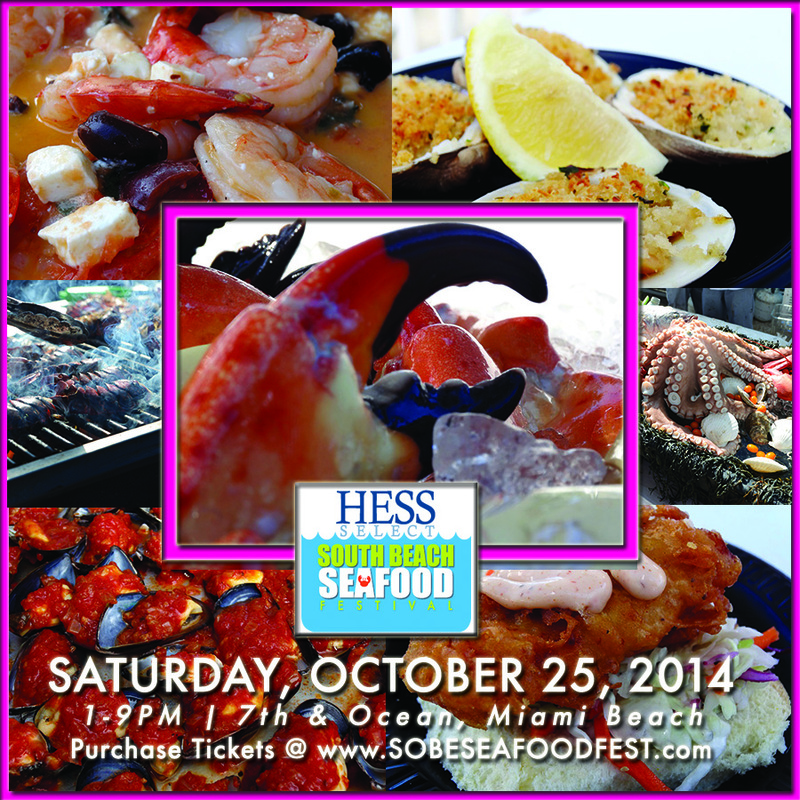 The Hess Select South Beach Seafood Festival Week is taking place on October 22-25, 2014. For more information and media inquiries please contact info@creativasgroup.com, 305.595.7888. Photographs and interviews are available by request. FORCE, the organization serving the Hereditary Breast & Ovarian Cancer Community is the chosen beneficiary of the proceeds from the Annual Power of Pink promotion at Brighton Collectibles, Aventura Mall. As one of the promotional events, Sunday, October 5th from 2 pm to 4 pm, the public is invited to join us to meet noted Breast Cancer survivors and authors Cindy Papale-Hammontree, The Empty Cup Runneth Over and Patricia San Pedro, also known as Positively Pat. They will be at the local store signing and selling their books to benefit the South Florida Chapter of FORCE. “The Cancer Dancer” author, Patricia San Pedro is a four-time Emmy-award winner who documented her entire breast cancer journey, in order to help others diagnosed with the disease. Her book, THE CANCER DANCER. Healing: One Step at a Time will guide you and your loved ones from a cancer diagnosis to discovering a new and more joyful way to live. Other events planned at the Brighton Collectible store include art shows and the Launch scheduled for Friday, September 26th. FORCE, is dedicated to improving the lives of individuals and families affected by hereditary breast and ovarian cancer, says South Florida Outreach Coordinator Debbie Setuain who is working closely with the Brighton store management team to bring additional promotions during Breast Cancer Awareness Month to the store. This will not only help sales and benefit FORCE, but also help with bringing attention to Breast Cancer and Hereditary Breast & Ovarian Cancer during the month. Next Galaxy Corp.(OTCBB:NXGA) a leading technology and content solutions company developing dynamic, innovative consumer virtual reality experiences and technology, is proud to announce that Randi Zuckerberg is scheduled to be the keynote speaker for the company’s Business Innovation and Growth (B.I.G.) Summit. Each year, The B.I.G. Summit welcomes sold out audiences of visionaries, thought leaders, venture capitalists, entrepreneurs, media, business and community leaders to a day of BIG Ideas for propelling business forward. The next B.I.G Summit produced by Next Galaxy Corp in partnership with the Miami Beach Chamber of Commerce will be held at the New World Center in Miami Beach, Florida on Tuesday, January 20th 2015. 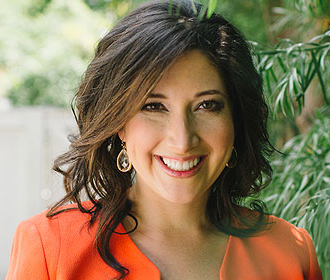 Randi Zuckerberg is a New York Times Bestselling Author, the founder and CEO of Zuckerberg Media, a media and production company, and Editor-in-Chief of Dot Complicated, an online community helping us navigate and “untangle” our wired, wonderful lives. Randi recently released her first books with HarperCollins, The New York Times Best Seller, Dot Complicated, which addresses the multifaceted complications of our socially transparent world, and a children’s picture book, titled Dot. As an early executive at Facebook, Randi created and ran the social media pioneer’s marketing programs and was nominated for an Emmy Award in 2011 for her innovative coverage of the 2010 mid-term elections. Since starting Zuckerberg Media, Randi has produced shows and digital content for PayPal, the Clinton Global Initiative, Cirque du Soleil, the United Nations, Bravo and Conde Nast, with many other projects in the works. Most recently, Randi launched her own radio show “Dot Complicated with Randi Zuckerberg” on SiriusXM’s business radio powered by the Wharton School Channel. “Randi Zuckerberg continues the tradition of superstar lineups that the B.I.G Summit is known for. The outstanding group of global thought leaders including Ms. Zuckerberg presents a rare opportunity for attendees to network and gain insight from the very best in the industry. We are excited to partner with the Miami Beach Chamber of Commerce to bring this extraordinary event to Florida,” commented Mary Spio, President of Next Galaxy Corp.
With each B.I.G. Summit focusing on trends that are disrupting business and consumers, Virtual Reality, Augmented Reality and Interactive Entertainment will be the primary topics of the upcoming event. Randi’s keynote will focus on future trends, based on her knowledge and insights from the front lines of Silicon Valley, into how the world is going to change in the next 2-5 years and what consumers and businesses need to do to make sure they aren’t left behind. Call for speakers for the event opens today, with opportunities for founders, thought leaders, C-level executives, venture capitalists and other industry visionaries to submit an application to offer insight and inspiration. Visit www.bigsummit.biz to register for the B.I.G Summit. Next Galaxy Corporation is a leading developer of innovative Augmented and fully Immersive Consumer Virtual Reality technology and content solutions. The Company’s flagship consumer product in development is CEEK, a next-generation fully immersive entertainment and social virtual reality platform featuring a combination of live, virtual and augmented events and experiences. Next Galaxy’s CEEK simulates the communal experience of attending live events, such as concerts, sporting events or business conferences through Virtual and Augmented Reality. In short, Next Galaxy is building the meeting places of the future. Miami Beach, FL (September 5, 2014) Golf enthusiasts will tee off in the 2014 Ed Morse Golf Classic to benefit Transplant Foundation on October 6th at the Miami Beach Golf Club with a 1:00 PM shotgun start. Registration begins at 12 PM, with a shotgun start for the scramble format set at 1 PM. Lunch and dinner will be served for players and their guests as well as an open bar from 5:45pm to 7:45pm. Participants will also enjoy a silent auction filled with prizes varying from a basketball signed by the entire Miami HEAT team, Dolphins memorabilia, hotel stays, a Nike R11 Driver golf club, and more. This tournament will support transplant patients and raise awareness about the importance of registering as an organ donor by furthering the Transplant Foundation mission of helping the community by providing assistance to transplant patients and their families, educating the community of organ and tissue donation, and funding research. The lives we touch through Patient Services funded by this tournament is a tribute to our corporate and individual supporters. This cause it critically important because there are currently over 123,000 people on the organ waiting list in the United States. Approximately every 10 minutes, another person is added to the list. 98% of adults have heard about organ donation, but only 45% of Florida is registered. Furthermore, 90% of Americans say they support donation, but only 30% know the essential steps to become a donor. Because one organ donor can save up to 8 lives and impact up to 50 people, it is vitally important to share the gift of life and make an educated decision to register as an organ and tissue donor, knowing that donors receive the same quality of care and that all major religions support this choice. Transplant Foundation Patient Services provides financial assistance to pre or post-operative organ and tissue transplant patients to cover emergency costs like medication, transportation, and other necessities. The emergency grants we give patients allows them to handle the burden of high medical costs while they apply for other funding. Because of our referrals from statewide transplant hospitals, we were able to double the rate at which we are assisting patients. We are proud to provide them with other benefits like the Mentor Program and education forums. The tournament fee for golfers is $300 per person and $1,000 for a foursome including a boxed lunch, practice balls, golf fees, cocktails and dinner. In addition, each player will have the opportunity to win a car provided by Largo Honda for a hole-in-one shot. 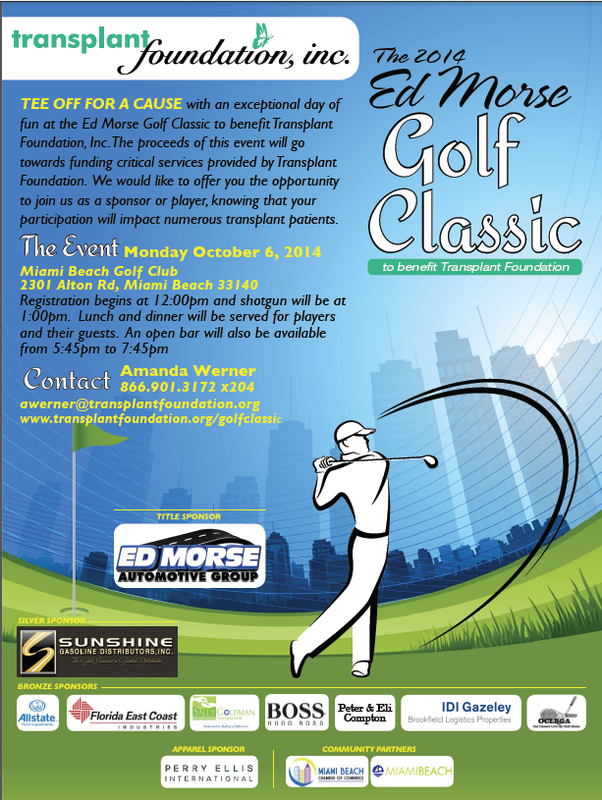 For further information regarding the 2014 Ed Morse Golf Classic visit www.transplantfoundation.org/golfclassic or call (305) 817-5645.